Even as Pakistan's PM is lecturing India on how to treat minority communities, religious minorities in his own nation are fighting to be recognised as humans. In the run-up to the July 2018 Pakistan elections, Pakistan Tehreek-e-Insaf (PTI) — Imran Khan's political party — promised to stop the forcible conversion of Hindu girls to Islam. Forcible conversion of Hindus, specially young girls, is one of Pakistan’s many ugly realities. Having seen the disappearance of most religious minority groups across the country, Pakistan has witnessed most Hindus moving to Sindh. About 70 lakh Hindus stay in Pakistan — most are in Sindh. And it is in Sindh that women and girls are reportedly frequently abducted, converted and forced into marriages. While this gross violation of human rights has been going on for some time, the matter again reared its head on Holi, March 21, when two minor Hindu sisters were allegedly kidnapped and forcibly married after being converted. The two girls, 13-year-old Raveena and 15-year-old Reena, were allegedly kidnapped by a group of ‘influential’ men, from their home in Ghotki district, Sindh, on the eve of Holi. As protests by the community grew, a video in which a cleric was purportedly shown soleminising the Nikah (marriage) of the two girls, was released. 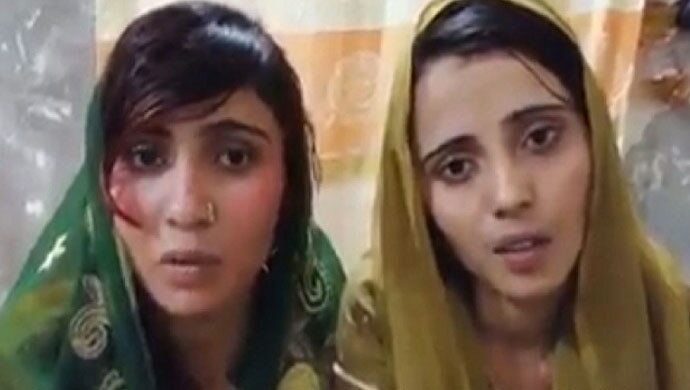 In another video, released a little later, the two sisters were shown claiming they had embraced Islam themselves and no one had forced them to convert or get married. But what actually exposed Pakistan's lies on the treatment of minority communities was a video of the father of the two girls, sitting reportedly outside a police station, hitting himself in desperation, lacking official help and redress, and crying out for his daughters to be released. In a desperate bid, the man is seen saying that either his daughters be returned to him — or he be shot. The desperation in the man’s voice, seemingly left alone by the authorities to just fend for himself, is a look at the sordid reality of Imran Khan’s ‘naya Pakistan’ — a place that has no place for religious minorities even as the Prime Minister brazenly gives India sermons on how to treat its minority groups. In February, Imran Khan was, ironically enough, giving lectures on how India should treat its minority communities, even as Hindu minorities in his own country were crying for help. 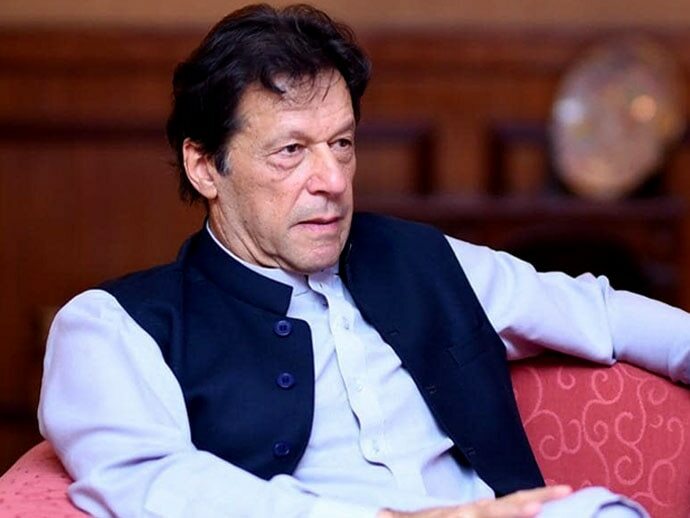 Khan said: "We will ensure minorities in Pakistan are treated as equal citizens with all rights and privileges — unlike how the Muslims are being treated in India as second-class citizens." In his own country, Hindus are struggling to be recognised as human beings though. The appalling abduction of the two young girls shows exactly that. If Khan would bother taking a look at data, he would know that Pakistan is no country for Hindus. In 1951, Pakistan had 15% Hindus — by 1998, that population had shrunk to 1.6%. While some attribute the dwindling Hindu population to a spate of conversions, others say that in the last 50 years, about 90% Hindus have left the country. The Human Rights Commission in Pakistan reports that 20-25 young Hindu girls are apparently abducted and converted every month. Bereft of hope for a dignified survival in Pakistan, Hindus are increasingly taking refuge abroad. The Pakistan Hindu Council estimates that about 5000 Hindus leave for India every year. As a responsible neighbour, India cannot keep its eyes closed and ears covered as a helpless minority group in Pakistan is persecuted in this manner for its religious identity. It’s not just Hindus. Christians too have been persecuted in Pakistan and its famous economist Atif Rahman Mian was removed from its top economic advisory council — simply because of his religious identity as an Ahmadi. Why doesn't Imran Khan divert his attention from lecturing us in India to looking at the dismal situation in his own country? India now must raise this issue across all global diplomatic forums to expose Pakistan and help save the lives of Hindu girls who live in fear of being abducted, converted and married off against their will. This is not merely an issue of religious identity. This is about human rights. And any proper country will stand up for that.